"In concealing nothing about the dark hours of our history we are simply standing up for a vision of humanity, of human liberty and dignity"
76.000 Jews were deported from France between 1942 and 1944. "100.000 objects and work of art were looted, along with several million books." Jean Mattéoli, Working Party on the Spoliation of Jews in France : general report, 2000. On 5 April, the CIVS receives the representatives of the commissions in Europe who, like it, are working on the research and restitution of the cultural property looted. 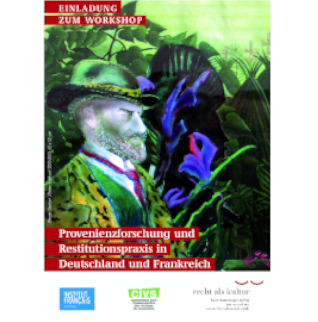 The CIVS, the Institut français d’Allemagne and the Käte Hamburger Kolleg “Recht als Kultur” (University of Bonn) organised on 20 and 21 February in Bonn a symposium entitled “Looted Art: Provenance Research and Restitution Practice in Germany and France”. The questionnaire for opening a file accompanied by the power of attorney and the proxy form. The CIVS is open from Mondy to Friday, 10:00am to 12:00pm and 2:30pm to 4:30pm. What does the CIVS do ? The CIVS provides the Prime Minister with the means to provide compensation for the material and financial spoliations that took place in France during the Occupation. Are bank-related spoliations compensated ? Bank-related compensation is governed by the Washington Agreement, signed between the French and American governments on 18 January 2001. How do I submit a claim ? Claimants must complete a questionnaire, available on this website, stating the name of the victim and the nature of the spoliation that took place.